Nutrition Month is hosted annually by the Dietitians of Canada. This year's theme is 'Best Food Forward: Plan, Shop, Cook, Enjoy!' What you eat plays an integral role in your wellbeing, and directly affects your oral health. You can visit this link for some helpful tips and tools regarding nutrition and your health, and to learn more about Nutrition Month. As always, we encourage you to learn more about your health, and remember that the kitchen is a great place to try new things. March Break is coming up - this is a great time to contact our office to schedule a visit! Our ongoing Social Networking Contest can win you a "Six month General Membership" to the Columbus Centre Athletic Club. We Will Continue Our Fundrasing Efforts! We here at Lawrence West Dental are proud to be supporting the Heart and Stroke Foundation's Heart Month Campaign. We will continue our fundraising efforts throughout March! Our staff members have each set a personal wellness goal for the month and invite you to join our efforts in raising awareness and much needed funds this Heart Month! Please visit this link to make a donation and help us reach our $1,000 fundraising goal. We'll be entering our supporters into a draw for a $100.00 Gift Card to Metro Grocery Store at the end of March. Together we can help create healthy lives free of heart disease and stroke! Donations may also be made by contacting Jessica Brayne at the Heart & Stroke Foundation 416-489-7111 x 739. Tanya and her boyfriend Jeff just got back from a exciting getaway in Las Vegas. 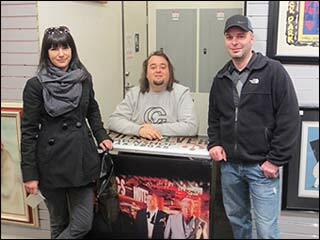 Guess which celebrity they met...... Chumlee from the World Famous Gold & Silver Pawn Shop! Columbus Centre Athletic Club Discount! We believe in building strong community relations! There you are, it's Saturday morning and you have the whole day ahead of you. You roll over and look at your better half and decide to give them a good morning kiss. But wait!!! What's been brewing in your mouth over night? Help your home get noticed! RE/MAX and Landscape Ontario want to help one lucky winner update the curb appeal of their home with custom designed landscaping. 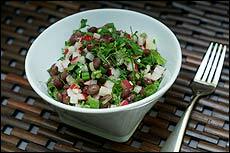 Legumes are plant-based foods that are packed with nutrients and can be instrumental to maintaining your overall health. They are high in protein, soluble and insoluble fibre and low in cholesterol. Legumes can be helpful in weight control, low in aid in digestion and extremely versatile, making them easy to incorporate in your diet.